At its 10th Un-carrier event today, T-Mobile announced what it has called Binge On. With Binge On, starting this Sunday November 15, T-Mobile subscribers can stream all the HBO, Hulu, Netflix, Showtime and other video services 1)Crackle, Encore, ESPN, Fox Sports, Fox Sports Go, HBO Now, HBO Go, MLB, Movieplex, NBC Sports, Sling TV, Sling Box, STARZ, T-Mobile TV, Univision Deportes, Ustream, Vessel, Vevo, Verizon Go90, AT&T DirectTV streaming service, and VUDU that they want without having it count against their high speed 4G LTE data cap. Binge On is available to all current and future Simple Choice customers on qualifying plans that start at $60 and include 3GB of LTE data or more. To sweeten the deal further, T-Mobile customers get an exclusive discount of 30% off of a year of Best of Live TV with Sling priced at $14/month. Furthermore, unlimited LTE customers get a free movie to watch every month courtesy of VUDU. however for subscribers, and that is that Binge On will optimize video for mobile screens to minimize data consumption. Video streaming resolution should be at 480p or better, which is more than adequate for a mobile device but no more 1080p viewing. If customers are not happy with viewing resolution they can deactivate Binge On at any time and have video streaming for those providers count against their data cap. Those who don't qualify for the Binge On unlimited streaming perk, can still keep Binge On activated in their account and save data by watching video at the lower resolution. 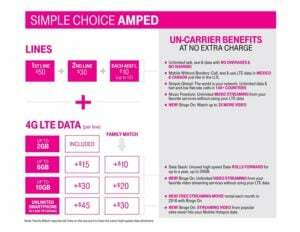 T-Mobile Doubles the Data of Simple Choice Plans with "Amped"
In what T-Mobile calls the biggest update ever to its Simple Choice plans, the carrier is doubling the amount of 4G LTE data offered with those plans. The $50 plan now gets 2GB of 4G LTE data instead of 1GB. Additional lines added to that plan will also receive double the data. Other Simple Choice plans include 6GB of data for $65 (instead of 3GB-$60), $80 for 10GB (instead of 5GB-$70), and $95 for unlimited (previously $80). The unlimited plan now includes 14GB of mobile hotspot instead of 7GB. T-Mobile is also offering what it calls Family Match. If everyone on the family plan wants the same amount of extra data, they can for example add an extra 4GB of 4G LTE data per line which includes mobile hotspot, for an additional $10 more per month. Other Family Match options include 8GB of extra data per line for $20/line, and unlimited data for $30/line. For those families who don't need extra data on every line, 4GB of extra data will cost $15/line, 8GB $30/line, and $45/line for unlimited. Changes to the Simple Choice Plans go live on Sunday, November 15h as well. Just literally received a txt alert from T-Mobile saying video has been optimized for Binge On. Our plan shouldn’t qualify correct? It’s only post paid Simple choice plans? Not that I care about Binge On but wanted to share. I actually got the same text yesterday. I logged into my account and saw that there was in fact an option to turn on Binge On. Our plans shouldn’t qualify for unlimited video streaming, but just receive the “benefit” of compressed video to save on high speed data. This is at least what I’m getting out of it, I couldn’t find anything else in my account to confirm or deny otherwise. Yep, that’s the way to make it work. There may be another plan coming out from another TMo MVNO that could be of interest to your wife. I don’t have all of the details yet, but received a tip about something that could be promising. As always thnx and look forward to any deals with the MVNOs.